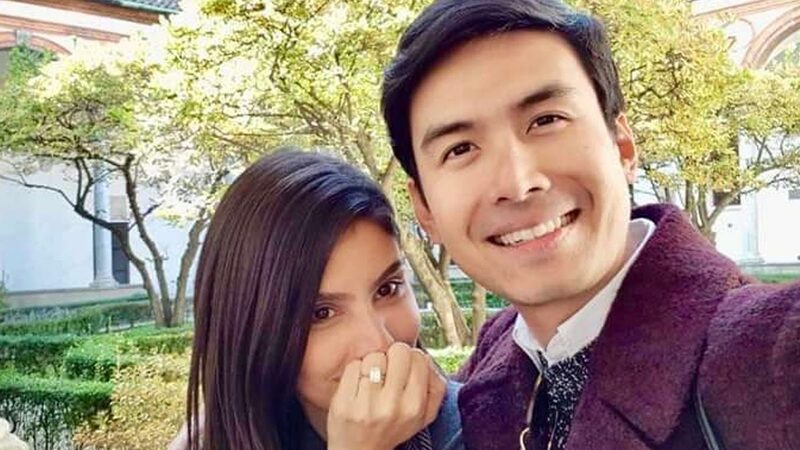 On October 30, Christian Bautista took to Instagram to announce his engagement to girlfriend of two years, Kat Ramnani. In the photo taken in Italy, the 36-year-old singer-actor posed with his non-showbiz fiancé wearing her engagement ring. In an interview with PEP.ph, Christian shared how he proposed to Kat—no drama, no frills. In the video, he said, “We [were] as plain as we [could] be. We just ate cold pizza. Nothing romantic. I felt, 'I think this is the right time.' I said, 'This is really us. No audience. Walang background. Just you and me.'" He continued, "I put it in a small bag [and told her] 'Hi, I have a gift for you.' Gan'un kasimple. [Then she said], 'Oh, is this candy from a while ago?' And then she was like, 'Where’s the candy?' and I said, 'No, it's inside.' She got it and said, 'Oh my God, is this it? Is this it?' [I said] 'Yeah, this is it.' Then I got it, I opened it, and I said, 'Will you marry me?' And then she said yes." Kat, Head of Music Content at Globe Telecom, met Christian in 2015. The two made their first appearance together as a couple in July 2016 at the Preview Ball, over a year into their relationship. The couple recently came back from their European getaway in October.